On this page, you will find the resources you need to participate in the #CCHLDifferenceMaker campaign. Whether you’re sharing your own story, showcasing an amazing colleague, or are just looking to help spread the word, everything you need can be found below. Each of you is a difference maker with a story to tell. Here’s how to get involved. 1. Write a description of the difference making initiative that you are most proud of, or share how your involvement with the College has been a difference maker. 2. Post your story on Facebook, LinkedIn or Twitter. 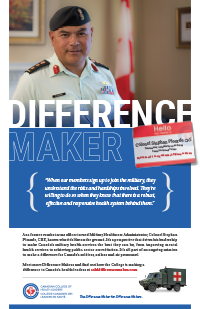 Be sure to include #CCHLDifferenceMaker in your post. Optional: include a selfie in your post and use our Share Your Story worksheet . Check out our toolkit, which provides more in-depth information on the campaign. The toolkit even has sample social media posts that could help inspire your own story. This is a great opportunity to recognize a difference maker who has impacted your work, your career or your involvement in the College. You can also feature a team of people. They don’t have to be a College member(s), all are welcome to participate. Check out our toolkit, which provides more in-depth information on the campaign. The toolkit even has sample social media posts that could help inspire your own post. 1. Take a photo, or video, of the difference maker(s). Get creative! It could be team photo, a picture of a mentor & mentee, a simple headshot, or even an action shot. We’d love to see people sharing photos from LEADS workshops, chapter events, and team meetings. 2. Post your photo, or video, on Facebook, LinkedIn or Twitter. Tag the individual(s), the organization, chapter etc. and be sure to include a caption describing why the individual(s) is (are) a difference maker. 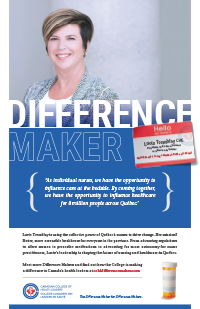 Don’t forget to include #CCHLDifferenceMaker. 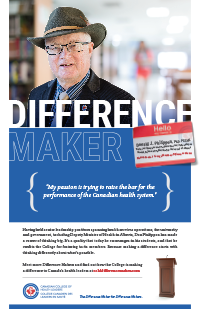 Use the campaign poster template, to create your own #CCHLDifferenceMaker poster. All you need is a photo and a short caption descripting the difference maker. The poster can be printed, included in slide deck, or even in a newsletter. Help us spread the message of this campaign by sharing the College’s #CCHLDifferenceMaker stories. 1. Follow the College on Facebook; LinkedIn; and Twitter and share posts tagged with #CCHLDifferenceMaker. 2. 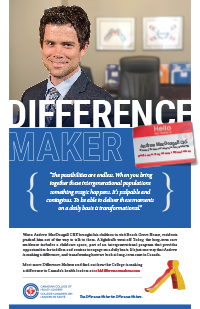 Share our #CCHLDifferenceMaker video. 3. When you see an inspiring article, or story, featuring a College member, consider sharing it on social media with the campaign hashtag #CCHLDifferenceMaker. 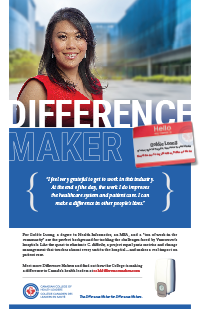 Thank you for supporting the College community and for sharing stories of amazing #CCHLDifferenceMakers. Check out our toolkit, which provides more in-depth information on the campaign and includes sample social media posts that could help inspire your own story. 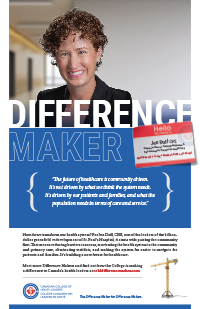 We've created social media friendly images of our featured difference makers, available here. Download our Communications Toolkit for full campaign details and lots of tips on how to get involved. When posting on social media, please include the hashtag: #CCHLDifferenceMaker . You can find the College on Facebook; LinkedIn; and Twitter. 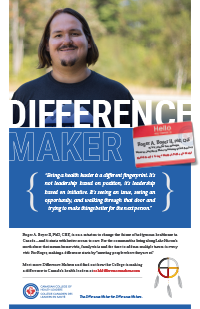 Download the template (PowerPoint) to make your own #CCHLDifferenceMaker poster. Download the College’s value proposition.